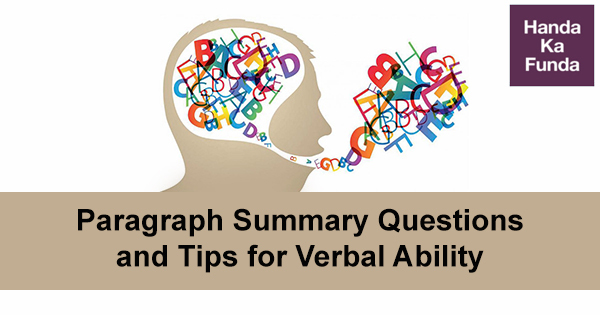 By now, you must be aware of 50% topics of the verbal ability section- vocabulary & RC. Let’s move on to another crucial part of VA, i.e. Verbal Reasoning. As the name states itself, this section intends to assess your reasoning skills. One of the most important types of questions in this section is based on paragraph summary. So, what is a paragraph summary? If someone asks you to summarise a 3-hour movie, how would you do that? And if it’s your favourite movie? Well, that’s the very purpose of summary questions. All you need to do is understand the paragraph and then, figure out the main idea of it. Sounds easy? What if, you are asked to summarize your favourite 400-page book in a few words? Yes, you definitely need to develop some skills to gain hold of summary questions. A paragraph may contain more than one message. Your purpose should be to identify the main idea or the central theme around which the paragraph revolves. Do not get distracted by the irrelevant points or facts stated in the paragraph. Before summarizing, ensure that you have understood the paragraph well. The chronology of the summary should be as per the given passage. The summary need to be precise, broad in scope and short. An effective way to develop this skill is to read a newspaper/magazine article daily and try to identify the crux of it. Well, if the paragraph/s expresses multiple ideas, try to combine them into one main point. A good idea would be to summarise the paragraph in your own words before looking at the options. It’s like analyzing and then, summarising an article that you read in a magazine. This will just simplify your task of identifying the correct option. Once you summarise it in your words, all you need to find out is which option conveys the same. For obvious reasons, vocabulary is the common string among all parts of CAT Verbal Ability. It would be great if you broaden your vocabulary base. This will help you in reaching at the correct answer accurately in less time. Another interesting way is to pick up your favourite topics and invest time in quality reading. It will enhance your comprehension skills as well as expand your vocabulary base. This is one of the most important skills. Answer options can often be misleading. Here, your ability to spot the right option is of prime importance. You need to search for the option that imitates the one you wrote in your own words. In another case, you may not have come up with the main point. In such a case of if the options seem too complex, you can make use of ‘elimination strategy’. It is a good idea to reread the paragraph if you need more clarity of the main idea. The best way to develop this skill is to practice summary questions from previous year papers and mock tests. As you would know, the paragraphs may belong to any field of study- philosophy, political science, history, science, humanities, etc. In other words, you may be unfamiliar with the subject. So, the first task is to read the paragraph/s like you would read a RC passage. Pick out the key points and ideas as you read. After reading it, you will be able to identify the subject about which the author talks. Once you have made a mental map of the essential points, try to see how they are linked. Putting it other ways, figure out what the author is trying to convey about the main subject. It is similar to the way a movie expresses a message in a number of scenes. So, try to think from the author’s point of view. This way, you are binding the sub-units so as to combine it into one single unit. Till now, you were spotting the major points in the paragraph. In this step, you need write them in your own words. Stating it other ways, summarise the main idea of the paragraph/s. You need to be careful of any irrelevant information given in the paragraph. Such unrelated information is meant to divert you from the right option. You summary should be crisp, short and accurate. Reread your summary to ensure that it conveys the main idea. Selecting the correct option- The goal of executing the above three steps! So, how do you go about this? When you have a summary written in your own words, all you need to do is to check which answer option resonates with it. Eliminate the unrelated answer options and choose the one that is most close to your self-written summary. The meaning of the chosen statement should remain the same. Do not get distracted by the options presented in a verbose manner. Also, you may assume that the summary lies in the last lines of the paragraph. However, this is not the case. The selected answer option should reflect the beginning, middle and ending of the paragraph in a succinct manner. The answer should be concise and grammatically correct. Make sure that your answer is ‘to the point’ and not beating around the bush. So, you must be thinking that such options will be rejected outright. But, most of the times, these answer choices relate to the same subject being talked about in the paragraph/s. That’s how they complicate the matters! Keep in mind ‘what is discussed in the passage’ and not just ‘about what’. If you have understood and analysed the passage well, you will be able to eliminate them easily. Example: If a passage talks about the social consequences and losses suffered in the world wars, you cannot choose an answer option that states the political consequences of the world wars. As the name says itself, such choices reflect a few ideas of the given paragraph/s and neglect the remaining important points. Sometimes, such choices state the facts accurately as per the passage but do not encompass the entire passage. In other words, such answer options are only partially true in terms of the given passage. Generally, it is preferred to select an answer option that is wide in scope. Example: If a passage describes the political and economic conditions of British India, the answer option cannot indicate the political aspect only. Well, what do you think an extreme option can be? Perhaps, when you overestimate or underestimate something or someone. Similarly, such options overstate or understate the facts given in the paragraph/s. In some cases, these answer options state the opposite of the ideas given in the passage. So, be very careful of such answer choices. If the author is using a critical tone while discussing a subject, you may be tempted to select an extreme answer that goes beyond the scope of the paragraph. So, try to limit the summary to author’s viewpoint only. What if a movie deviates from its central theme and takes an unrelated new turn? Well, that’s when you can’t recall what it was all about. On similar lines, such answer choices conveys the main idea but also gives additional information. This new information may not be related to the given passage at all. In other ways, the answer option seems to pick up an incomplete idea stated in the paragraph/s and complete it with a new point. So, it’s absolutely necessary to read the full statement before choosing it. Also, do not let your personal opinion come in the way of choosing the answer option. By now, you are well-aware of the strategy to tackle paragraph summary questions. The next step should be to execute it in an efficient way. Well, it all boils down to two things- reading and practicing. The more you read, the better will be your speed and reading skills. An active reader can grasp the underlying message of the paragraph in a more accurate and timely manner. Further, practicing such questions on daily basis will acquaint you with the kind of questions you need to solve in CAT. Lastly, brevity is the key to summarise a paragraph.